Let's talk mantels. When you decorate a fireplace mantel, you're creating an important focal point for the room. Think of it as a display case that you get to change out every season. Not sure where to start? Find inspiration in these 10 ideas that can turn your mantel into its own piece of art. When you're not sure how to decorate the mantel, the simplest tip is to go for symmetry. Balance a large object in the middle with identical pieces on either side. This will result in a triangular formation, like the one in the example with the clock at the top, and the vases to the left and right. A triangle is a visual composition that is very pleasing to the eye. Another useful tip for decorating the mantel is to think in threes. Choose three different types of objects and display three of each type. In the example, the three object types are candle holders, picture frames and books. They are anchored by one large piece of artwork to create a triangular formation. Notice how the three books are not positioned together. Breaking up the three adds visual interest to the arrangement. Choose a rich hue like orange or purple, and have all your display objects in the same color family. The monochromatic look is chic and modern. As you can see in the example, the principle of threes also applies here, with three vases, three books and three suitcases. Because all the orange objects are around the same height, the clock was added to draw the eye up. When displaying objects, try to make them of variable heights so the eye can move up and down. Also, layer them from back to front so they are not on the same plane. In the example shown, the objects form a triangle when you look head on, with the D forming the top of the triangle. If you were to have a top-down view, you would see smaller triangle formations on the left and right as well. If you have several framed prints or art pieces gathering dust in the closet, it's time to take them out. They look beautiful grouped together as an impromptu gallery on your mantel. Again, make sure they are of different heights and overlap them to create layers. You can even add an empty frame so that artwork is peeking through. Autumn foliage is too beautiful to keep outside. 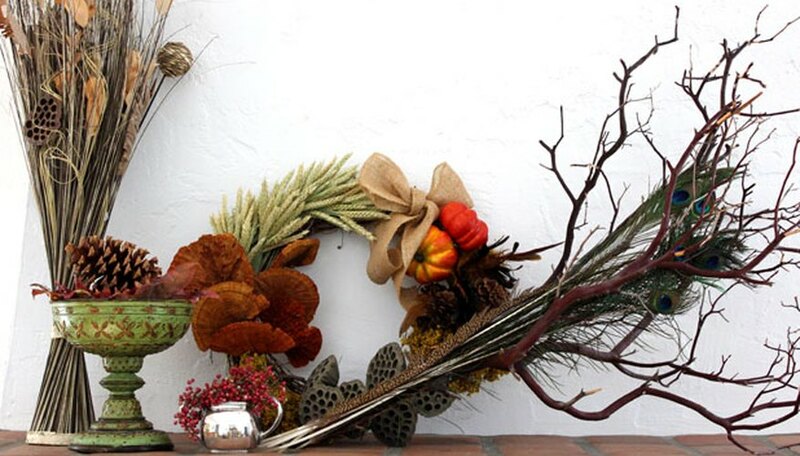 During the fall season, bring natural elements inside for a display that celebrates the autumn harvest. Use tall grasses, branches, bowls of rust-colored leaves, pinecones and whatever you might find in your yard. In the example shown, the wreath of fall elements is flanked by taller pieces, so instead of a triangle formation, we have a wave. 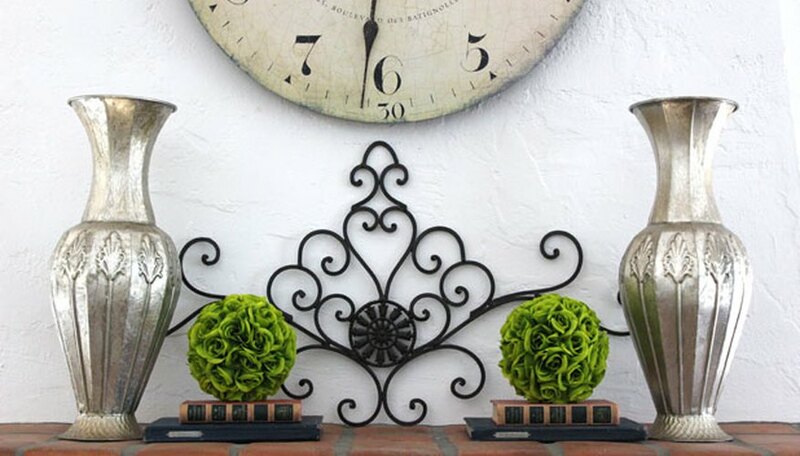 This free-form shape, like the mantel elements, is more organic. Play with soft textures to add warmth to a room. 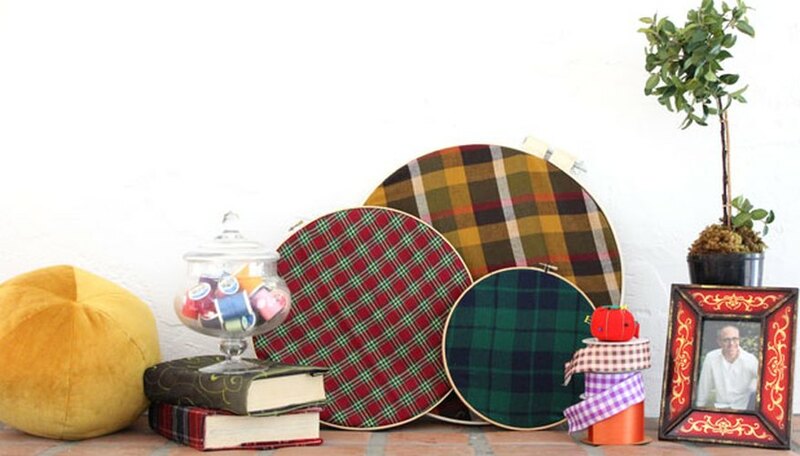 Here in the example, soft flannel fabric is displayed in embroidery hoops. Even the books are wrapped in fabric. A round velvet pillow that echoes the shape of the embroidery hoops adds another element of comfort. And the plant on the right creates height to form, yes, a visual triangle. 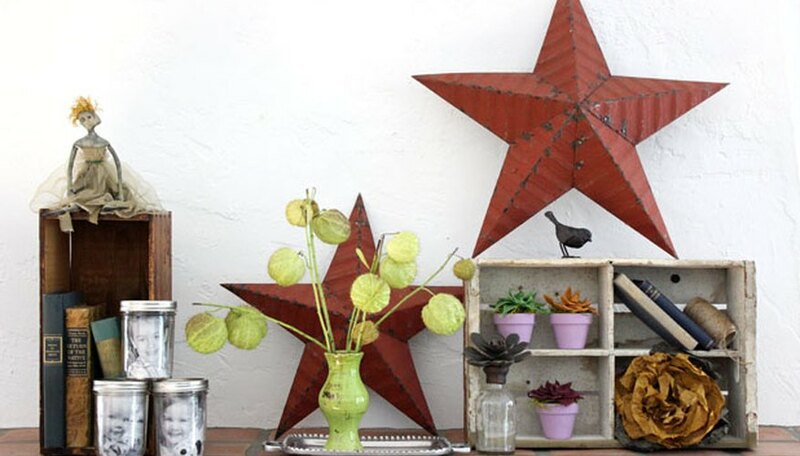 Vintage crates give your mantel a rustic feel, and they play double duty as storage to display other objects. If you don't have crates, stop by your local flea market for an assortment. Soda crates, with their compartments, allow for layering your collectibles. Mason jars make unique photo frames – just slip a photo inside and close the lid. If you're the sort that loves school homecomings, tailgate parties and waxing nostalgic about the old alma mater, a school-inspired mantel can be a smart choice. Dig out the old class photos, books, lunchboxes and other school mementos for a trip down memory lane. Include a framed chalkboard to write a message. Are you a fan of mid-century modern? Give your mantel a 60s Mad Men twist. 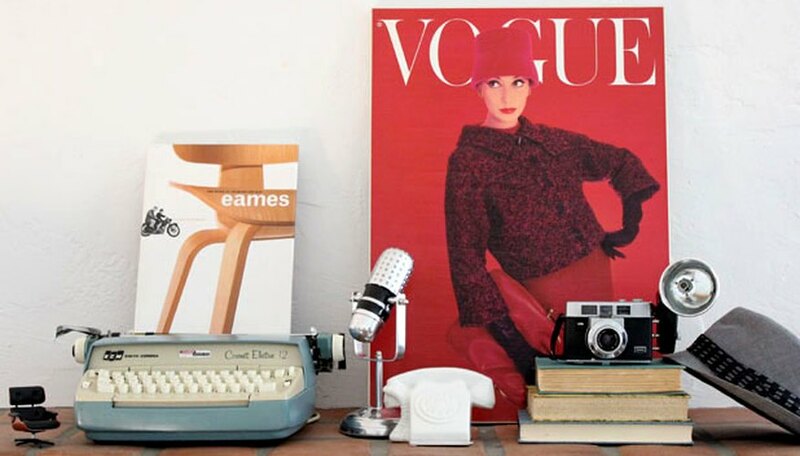 Objects like classic typewriters, cameras and even hats add an unexpected, yet breezy, sophisticated look. Don Draper would feel right at home.